Is there someone else Narcissus? Narcissism is a word that gets used a lot these days, mostly because of the American election, but I am absolutely going to say nothing else about that because I want to focus on the central message of Craig Malkin’s 2015 book Rethinking Narcissism: The Bad – and Surprisingly Good – About Feeling Special. This book started off perfectly for me since, right after the introduction, Malkin retold the myth of Narcissus, making it unnecessary for me to find my university copy of Bullfinch’s Mythology. From the myth about the beautiful young man, admired by many and convinced that the many were correct, the term “narcissism” was first considered in a psychological sense by Sigmund Freud in his paper: On Narcissism: An Introduction. Malkin tells us that Freud’s introductory consideration of narcissism was developed in the 1960’s and 1970’s by Heinz Kohut and Otto Kernbergbut, but via Kohut’s self-psychology movement, the term narcissism and the concept of unhealthy narcissism moved into the Diagnostic and Statistical Manual of Mental Disorders of the American Psychiatric Association, a manual in wide use and, for most psychologists and psychiatrists, the standard of care. Dr. Malkin’s goal in writing this book, he tells us, is “…to help you not only understand and cope with the people around you…but also to better understand yourself.” To do this, Malkin takes the reader on a consideration of both healthy and unhealthy narcissism. The book has a number of features that would make it popular, but here’s the key: Early in the book, he introduces the Narcissism Spectrum Scale, developed by Malkin and two colleagues, Dr. Stuart Quick and Shannon Martin. Using the scale, the reader can determine their own place on the “Narcissism Spectrum” and then go on to read about how narcissism develops, the advantages of healthy narcissism and how to develop a healthier attitude towards one’s own narcissism. This does provide some very valuable tools for dealing with the people in your own life whose narcissistic traits are difficult to negotiate in day-to-day situations. There are also good suggestions for parents trying to raise a child who has a healthy degree of narcissism. There is really not especially good advice for a person who has gotten into trouble because of narcissism and who is contemplating self-improvement. Perhaps, there are not enough people in this category to make this worthwhile?? One chapter worth reading all on its own is the chapter on social media. It has advice about Facebook and Twitter in particular, but also summarizes some of the studies exploring the psychological impact of social media on self-esteem and mental health in general. If you’re wondering about joining Facebook or Twitter, or what the attraction is, this is certainly worth reading. Rethinking Narcissism also has all the hallmarks of a well-written, well-researched nonfiction book. It has an index, references for the factual information provided and even a small section listing further resources for any who might want these. Finally, if you happen to be from Ottawa, Canada, Dr. Malkin references the work of well-known Ottawa psychologist, Dr. Sue Johnson. 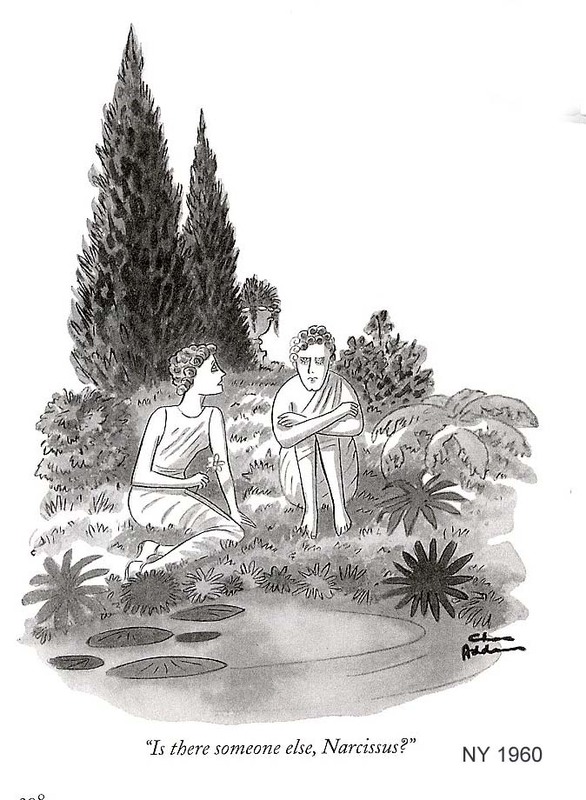 This is worth the investment of time to learn a bit more about “narcissism”, and, as a special bonus, you get to see one of my favourite New Yorker cartoons. Very concisely reviewed. Thank you, Look forward to reading the book.